Providing good heating controls can be a vexed question as the publication “Controls for End Users: A guide for good design and implementation” makes clear. It points out, for instance, how “many control systems in buildings are nowhere near the functionality of a typical car dashboard”. It is free online and well worth viewing if you are contemplating anything more than the most basic heating controls. It’s a lot to do with how people understand conventions. For instance most people know that if you turn a volume control clockwise the sound goes up but if you turn a tap clockwise the flow of water goes down. Good controls can be the key to not only a greater degree of comfort but also to energy saving. The system can remain running all the time but the boiler and pump are only running when a radiator (or cylinder) is calling for heat. This saves on pumping costs. It also means that hot water will always be available. You can over-ride the programmer to increase or decrease the temperature at any time and it will only affect the zone you are in. It nearly always removes the need for an optimiser because the warm up period on a morning is predictable, rather than relying on the weather. Note that in the example shown in the diagram the living and dining areas are open plan so that they can share one programmer. Note also that if you tried having two bedrooms sharing one programmer it would be difficult to get it to work properly because although the timing would work, the temperatures might not match up. Note also that the cylinder always gets priority of hot water and does not require a two way valve. The differential pressure valve is necessary for when all the radiators are closed and the cylinder calls for heat. This setup works for a well insulated house since even if the cylinder is taking most of a boiler’s heat output for an hour or so there will be plenty remaining for space heatingthe heating of the rooms as opposed to the heating of the domestic hot water. See Space heating and Domestic hot water and the air temperature in the rooms will drop very little. Zoning can save a good deal of energy because only the areas that need heat are getting it. It is particularly useful for rooms where someone has a special requirement such as an elderly relative who may need heating when others don’t, possibly also people who work a lot at night. There are a couple of drawbacks: some people find the programmers difficult to adjust (although most people can work the over-ride button). Also the equipment is a bit more expensive and the electric valves may be prone to failure if the circulant is not well filtered. 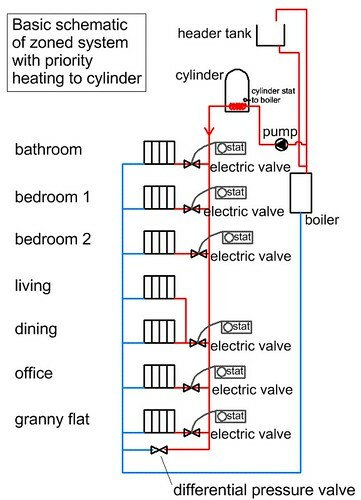 This is probably the commonest arrangement for central heating circuits in the UK but not the best one in terms of energy efficiency or comfort. It ensures that the heating is switched off when you want it off and that no room is warmer than it needs to be. What it does not do is allow you to maintain a minimum temperature (say during the night or during the day when you are out at work) and it does not allow you to vary the temperature up and down in different rooms depending on the time of day unless you are willing to run around adjusting the TRVs all the time. By far the craziest approach is to have TRVs on all the radiators and then to have an electrical thermostat in the hall to override the whole system including the TRVs. This is still not uncommon to see. The problem is that the hall is probably the least representative room in the house for having a thermostat. For instance a gust of cold air from the front door may cause the heating for the whole house to kick in, even if all the other rooms are warm enough. Alternately the thermostat will react to heat nearby and prevent a radiator functioning properly somewhere else. One of the reasons people still do this is when they want the heating to be able to shut down at night and use a combined thermostat and timer rather than just a timer. The answer then is to turn the thermostat up high and let the TRVs do the temperature control and only use the timer function. Boilers need to put out more heat in cold weather. Optimisers are small computers which monitor the outside weather temperature in order to tell a modulatinga modulating boiler is able to gradually turn itself up and down depending on how much heat is required. This is more efficient than cycling on and off. boiler how low a temperature it can run at to do its job effectively. When boilers (and even more so, heat pumps) run at lower temperatures they are more efficient.